All hail the new World Champions! After four days of clever planning, skillful duels, and furious battles, the 2018 November World Championships have come to a close. From Wednesday through Sunday, hundreds of talented players converged on the Fantasy Flight Games Center from across the world to compete in hundreds upon hundreds of matches. In the end, even though the crowd was loaded with talent—and dozens of contests were decided only at the very last moment—three players rose to the top, claiming the World Champion titles for A Game of Thrones: The Card Game, Legend of the Five Rings: The Card Game, and Runewars Miniatures Game. Today, we're happy to celebrate these champions and their success by sharing their World Champion lists along with some of the event's highlights and statistics. 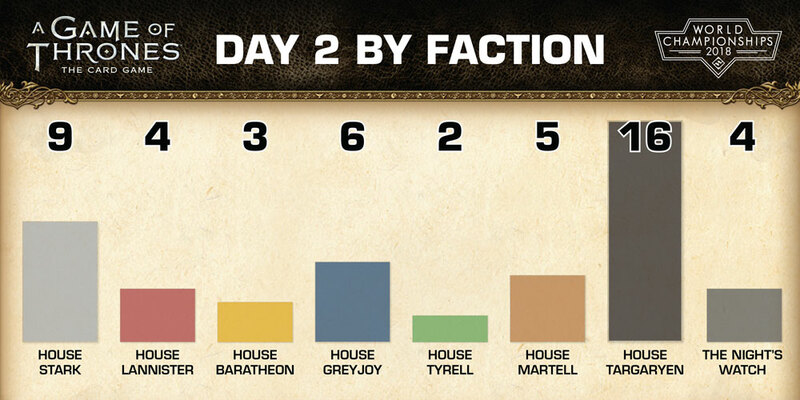 The numbers suggested that we should have expected someone playing either House Targaryen or House Stark to win the 2018 A Game of Thrones: The Card Game World Championship and claim the Iron Throne. 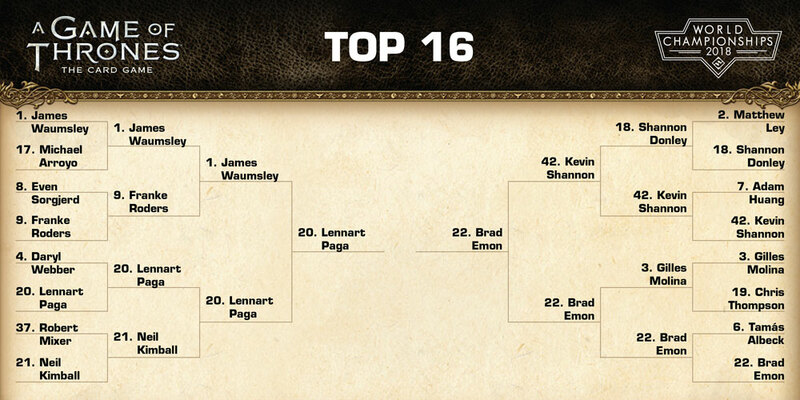 They were the two most heavily represented Houses on the tournament's Day 1A Swiss rounds, two of the three most heavily represented Houses on Day 1B, and then, again, the two most heavily represented Houses heading into the Day 2 elimination rounds. Lennart Paga, however, had other plans. 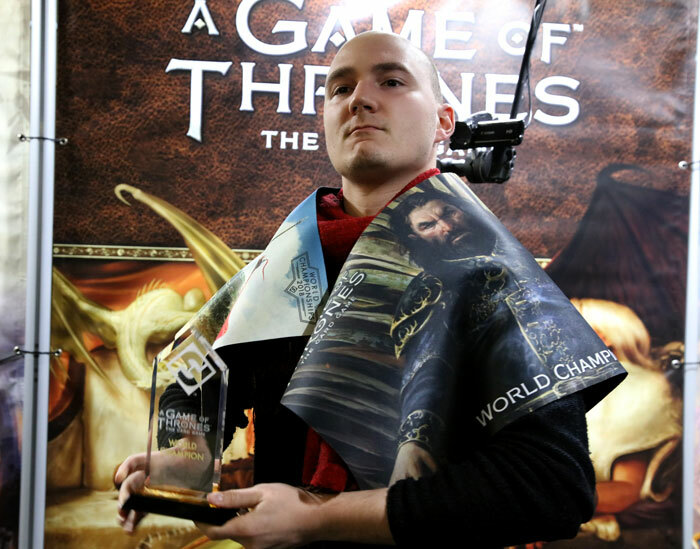 He played House Martell and plotted his way through the field, relying upon his Banner of the Wolf and Flea Bottom to overthrow the tournament's top Stark and Targaryen players and win the title of 2018 A Game of Thrones: The Card Game World Champion! Flea Bottom featured prominently in Lennart's deck. Though the location was Restricted with the last FAQ update, it proved well worth its inclusion in Lennart's deck, as he was running a heavy contingent of characters whom he could use Flea Bottom to bring into play and whom then allowed him to trigger potent "enters play" Reactions or whom he could sacrifice—as with Bran Stark—to limit his opponent's options. Lennart's Martell deck is a true example of clever design, and it is now available for download. Although Lennart's cunning use of Flea Bottom helped carry him to the 2018 World Championship, he was by no means the only player in the Top 16 who felt the card retained its importance, even while restricted. 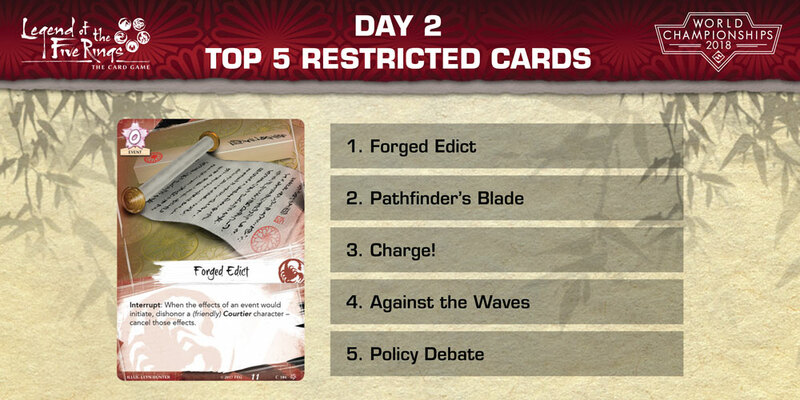 Of the 16 top players, 9 of them included the location in their deck, making it easily the most popular Top 16 restricted card. 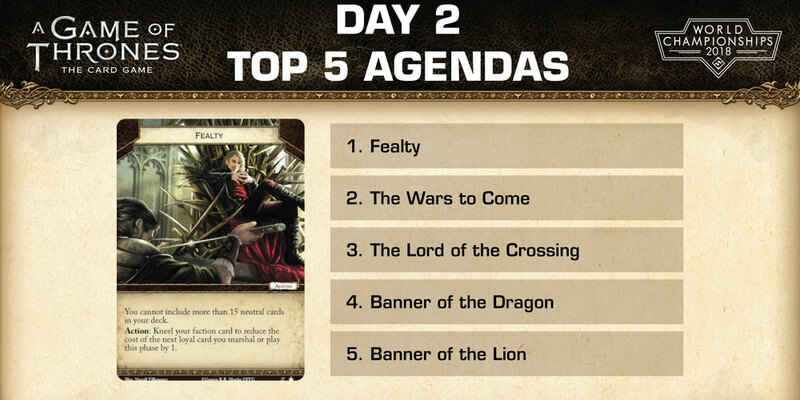 Meanwhile, the top Day 2 agenda, Fealty, took a spill as the event headed into the Top 16. Only one Top 16 player was using the agenda, and though The Wars to Come unsurprisingly rose to prominence (with 5 players), the prominence of Banner of the Wolf may have been a surprise. Lennart wasn't the only player to use the agenda. Three of the Top 16 players found tremendous value in courting the Starks. You can still find the video of Lennart's victory archived at www.Twitch.TV/FFGLive. Note: The players' seeding was determined upon their qualification for the Day 2 elimination rounds. After a year that saw the Scorpion Clan dominate most Organized Play events for Legend of the Five Rings: The Card Game, Erik Baalhuis strode confidently into the heart of Scorpion territory and—with the Emperor's attention fully devoted to the contest—outdueled Scorpion Johnny Shen in the final match of the 2018 Winter Court World Championship. For his victory, Erik was honored with the title of Shogun. Erik played multiple games on the weekend's livestream, and his play throughout was marked by a patience that suited his Crane deck perfectly. He leaned into the Crane's strengths with a good number of reactive, controlling cards, including Mirumoto's Fury, his choice of Restricted card—a choice which notably set him outside the trends set by most other Day 2 qualifiers. In several games, Erik's keen use of Mirumoto's Fury allowed him to bank fate for later use—and to play any of the 8 characters in his conflict deck, often bringing a character like Menacing Iron Warrior into play with three or four additional fate to make the Warrior a threat for future rounds. As a result, players who mistook Erik's patience for a lack of options were quick to find their mistakes punished. You can find Erik's livestreamed matches archived on our Twitch.TV channel, and you review the exquisite balance of Erik's Crane deck for yourself. It is now available for download. Although Erik's impactful choice of Mirumoto's Fury set him apart from most Day 2 contenders, he was by no means the only player to spend his influence on support from the Dragon Clan. 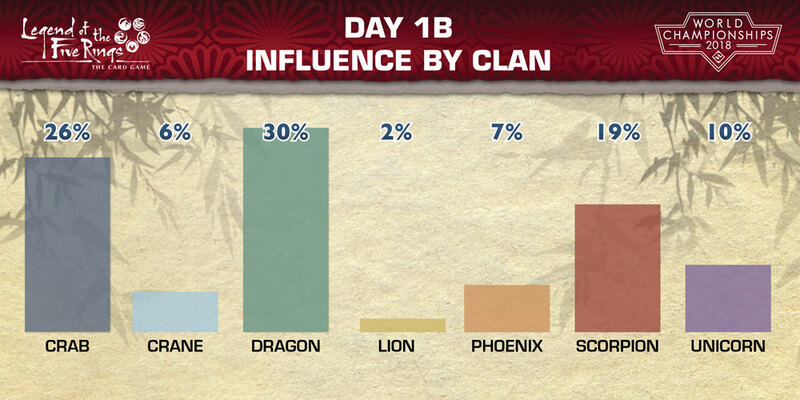 Fully thirty percent of all Day 2 players splashed Dragon Clan cards into their decks, and that was on top of the 14% of all players who were playing Dragon Clan decks in the first place. 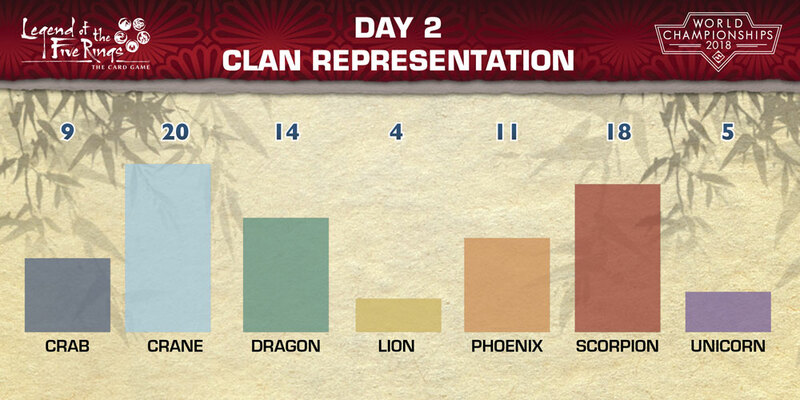 As one might expect, the Scorpion Clan also crept into the Top 16 in good numbers… and there are rumors that clan may have stopped short of ultimate victory simply to avoid the extra scrutiny. If this is true, one can only wonder: Are we likely to see the Scorpion back to their scheming ways throughout the next year of Organized Play? The 2018 Runewars Miniatures Game World Championship began brightly with an array of armies that saw good representation from all four factions and heroes both old and new. 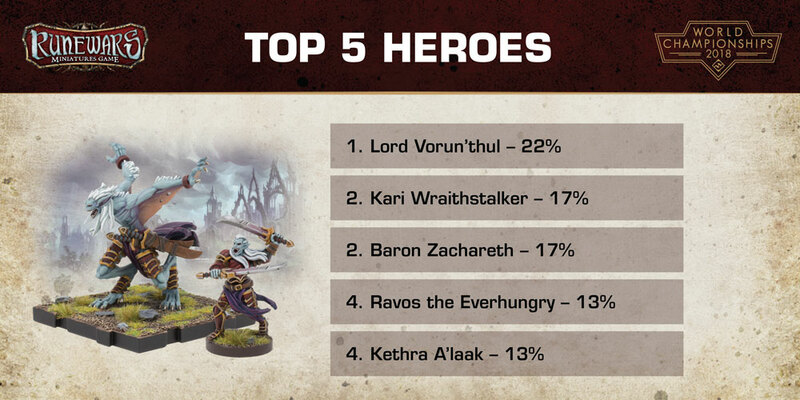 The Daqan Lords dominated the early proceedings, having won the loyalty of 35% of all participants, and the Daqan leaders Kari Wraithstalker and Baron Zachareth tied for the second most popular heroes at the event, right behind Waiqar's stalwart knight, the vampire Lord Vorun'thul. 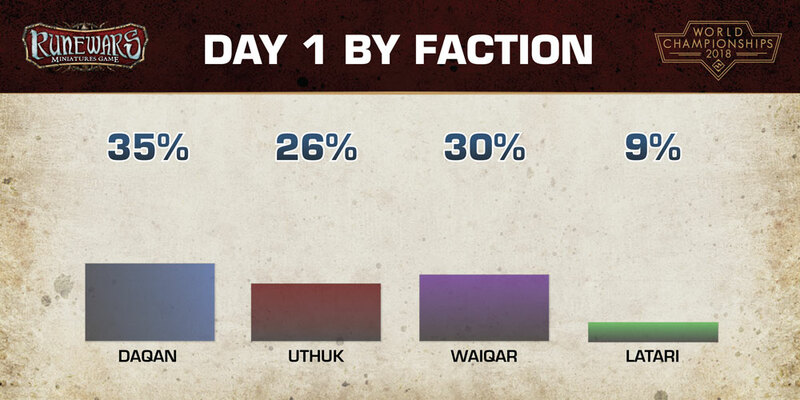 But as the day wore on and the battlefields grew slick with blood, it was the brutal Uthuk Y'llan who dominated the 2018 Runewars Miniatures Game World Championships. Their forces drew upon their Ynfernael strength to run rampant across Terrinoth's most important battlefields. 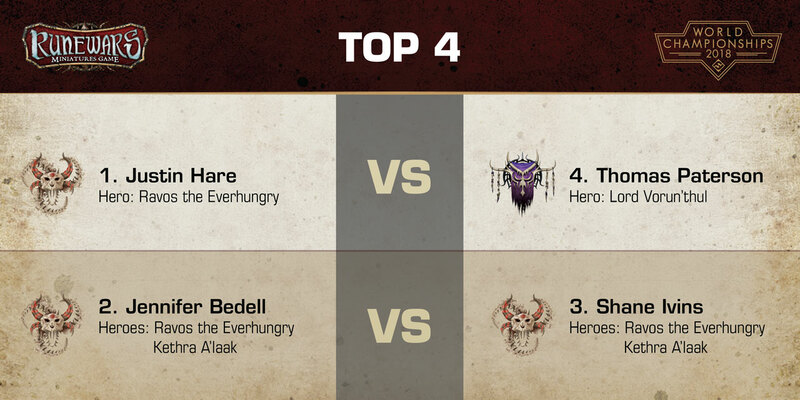 Of the event's Top 4 players, three of them had tied their fates to those of the Ynfernael hordes, and two of them made the finals, crushing the last of Waiqar's forcs along the way. 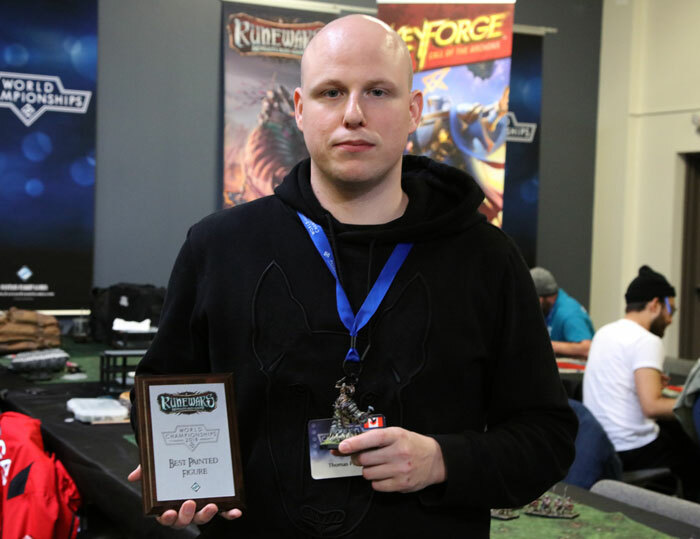 In the end, it was Justin Hare who fought with the most ferocity, battling past Jennifer Bedell to claim the title of 2018 Runewars Miniatures Game World Champion! Arguably the most notable difference between Justin's army and the one that Jennifer played was the fact that Justin ran just one hero—Ravos the Everhungry—while Jennifer ran Ravos alongside the witch Kethra A'laak. This left Justin with more points to spend on his infantry, and he committed 68 of those points to a full tray of Berserkers loaded with Tempered Steel, Frontline Spined Thresher, Warsprinter, and Aggressive Shrieker. Justin spent the rest of his points on Spined Threshers, while Jennifer had gone all-in on the Spined Threshers, herself, including no fewer than four Spined Threshers units in her army. Justin's army list is now available for download. You can still find the video of Justin seizing his victory in our archives at Twitch.TV/FFGLive. 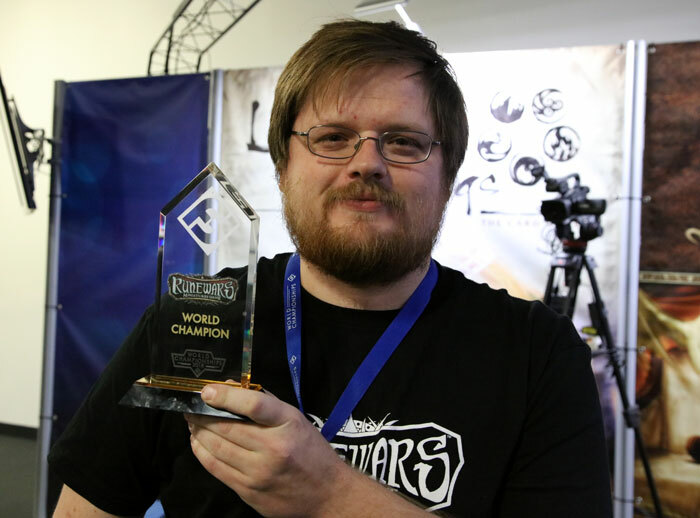 Notably, Justin wasn't the only champion among the Runewars players in attendance at the 2018 November World Championships. We also celebrated the dedication and talent with which players customized their armies. 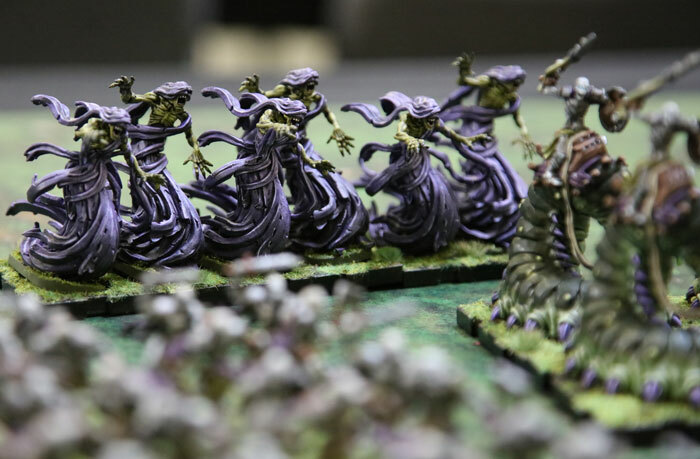 Judges awarded prizes in two categories—Best Painted Figure and Best Painted Army. 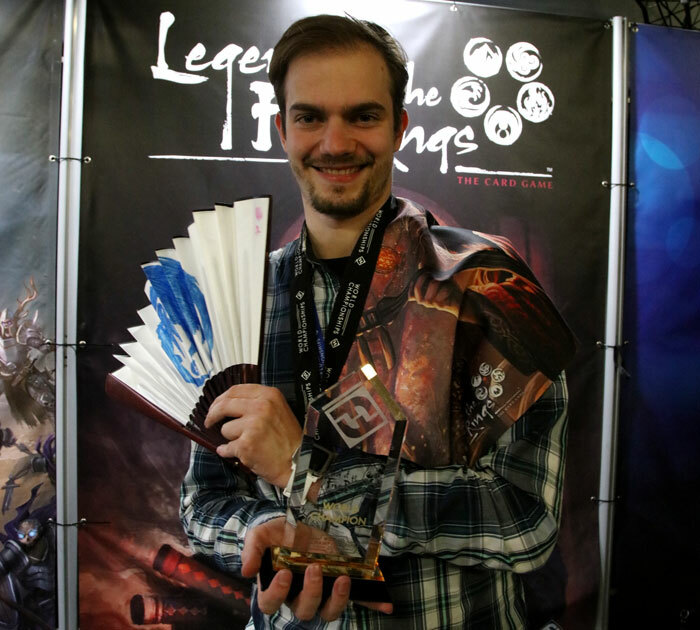 Thomas Paterson was the winner of the Best Painted Figure prize with his Carrion Lancer. Curtis Chandler claimed the Best Painted Army prize with his Waiqar forces. Once again, we want to congratulate our new World Champions and give our thanks to everyone who attended the 2018 November World Championships. Your enthusiasm, skill, and sportsmanship were fantastic all weekend long, and we look forward to seeing many of you at the 2019 World Championships. In the meantime, you'll find much of the action archived (for now) on Twitch.TV/FFGLive, and you can start along your journey to next year's World Champonships by watching the stream, downloading the World Champioship lists, and getting a better sense of how these games are played at the very highest levels! From November 1st – 4th, the 2018 November World Championships took place at the Fantasy Flight Games Center in Roseville, MN. 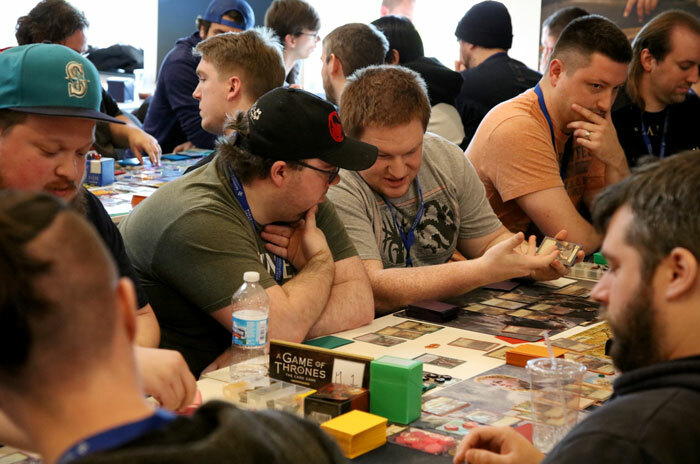 The world's best players gathered to compete in A Game of Thrones: The Card Game, Legend of the Five Rings: The Card Game, and Runewars Miniatures Game and enjoy a four-day international celebration of gaming!